A quick post this morning to share my card for Ellen Hutson’s Pin- Sights Challenge. 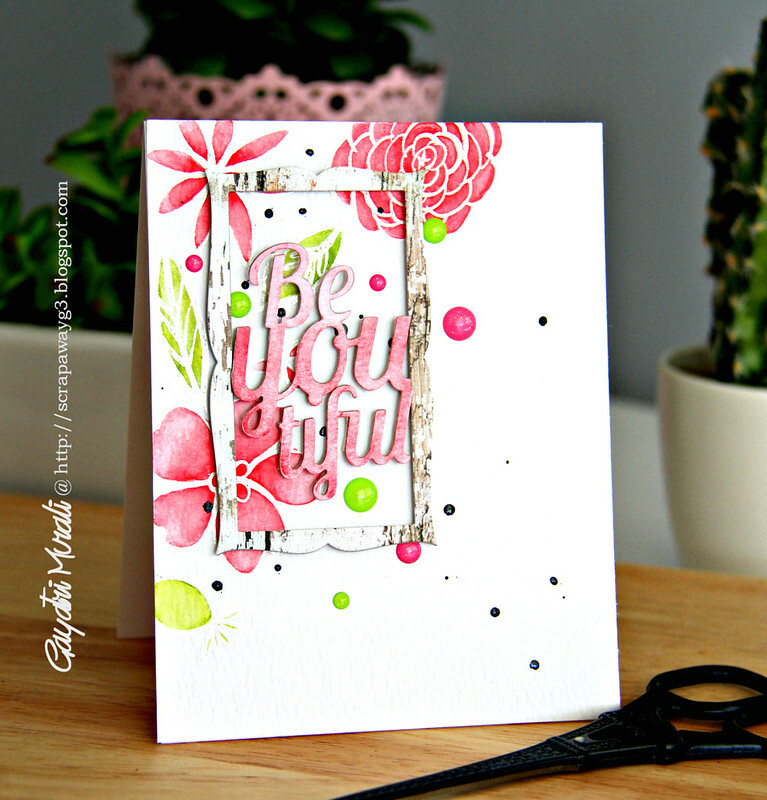 I used Bohemian garden stamp set from Essentials by Ellen to white heat emboss and watercolour. Then added some spatters with black Me. Huey. 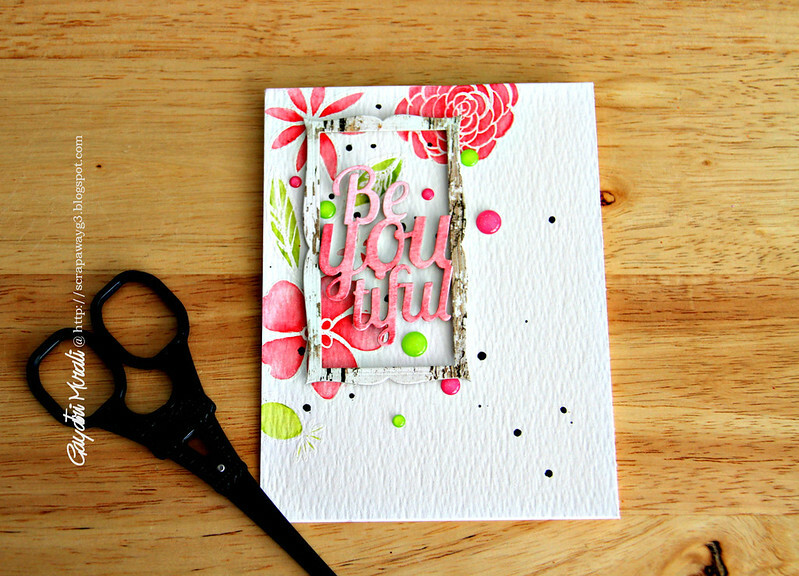 I also die cut the Be You-tiful die by Essential by Ellen using watercolour paper, then brushed pink watercolour to give an ombre effect. When dry, I stacked glued the die cut with two more die cuts. 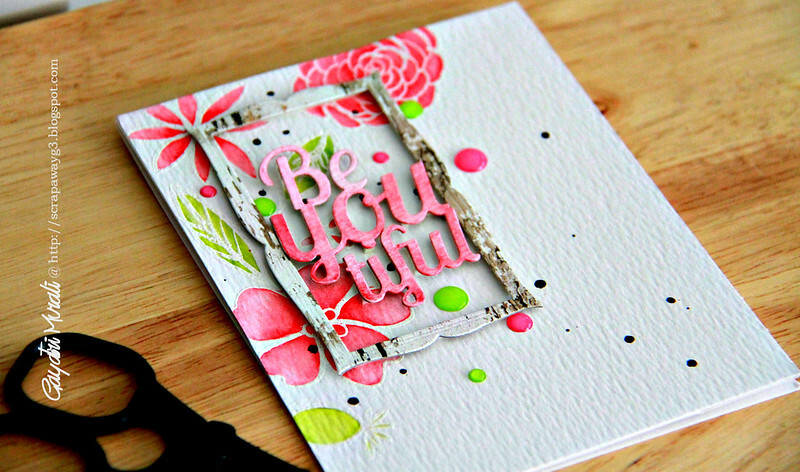 The frame is from Taylored Expression Frame in a Frame die set. I die cut using woodgrain pattern paper from My Mind’s Eye and couple more from cardstock. Stacked glued them to give stability and adhered on the card front using foam adhesives. I then glued the sentiment die cut inside the frame. Finally accented with pink and green sparkly enamel dots from Doodlebug. Wow!! Such a gorgeous card ..Totally love it !! Very pretty Gayatri. Just gorgeous colours. I do love it! I, unlike you, shy away from strong color. I blame my Mom, who always wanted me to be a lady… tone everything down. Anyway, that's me story and I'm sticking to it. This is why I love to stalk…er…see what you create because your use of bold color fascinates and delights me. This is gorgeous. Simply GORGEOUS!